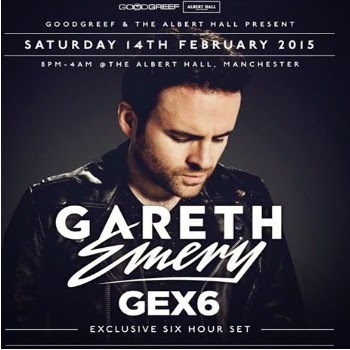 Gareth Emery: GEX6 coming to The Albert Hall, Manchester this February! Gareth Emery is well known across the globe for his distinctive style, combining elements of trance, house and progressive into his tunes. Given his breakthrough into the electronic music community in the early 2000s, he has enjoyed support from the likes of Paul van Dyk, Judge Jules and Armin van Buuren to name a few. His debut vinyl release was a remix of the classic tune ‘Nervous Breakdown’ by The Shrink, which got airplay on Radio 1 from Mardi Gras festival, however the track that is considered by most to have launched his career is his third release – Mistral – a track that was completely composed on a computer whilst he was on holiday in France. He’s released several mix CDs throughout his career and his debut album Northern Lights was released in 2010 to critical acclaim – climbing to the top of the iTunes dance music chart. He’s also set up his own label – Garuda, releasing tracks from the likes of Ferry Corsten, Markus Schulz and Sander van Doorn, and running occasional nights at Manchester hotspot, Sankeys. He has appeared at UK superclubs Godskitchen and Slinky, headlined Passion on his first appearance at the club, and has gained a reputation for being one of the most exciting DJs in the dance music community. His status as an international DJ has been sealed with bookings in Sweden, Holland, New Zealand, Australia and Canada – he’s definitely racked up some air miles! As Mixmag wrote when they first tipped Gareth for success in late 2002: “boring DJs beware: Gareth Emery is about to kick your arse”, and they certainly weren't wrong. Gareth was also responsible for one of the world’s first electronic dance music podcasts, covering a wide range of genres within the dance scene, running from 2006 all the way to November 2014. He’s also managed to feature in DJ Mag’s Top 100 list several years in a row, his highest appearance at number 7. Nowadays, Gareth spends his time mainly in Los Angeles with his wife Kat. Having released his third artist album ‘DRIVE’ and spent most of 2014 touring heavily across all continents he is now taking the time to enjoy life as a family man. Gareth will be making one special appearance on UK shores this year- on 14th February he will be returning to Manchester’s prestigious Albert Hall as part of the heavily anticipated Transmission series. He will be playing a UK Exclusive 6 hour Open to Close set which promises to be massive, a veritable journey through his music and development as a DJ and producer - there’s definitely going to be something for everyone; whether you’re a fan of his trademark Garuda sound or his newer material as showcased on the DRIVE tour and new radio show ‘Electric for Life’. Tickets are on sale now for what is sure to be a great night!